The Houston Texans were 2-2 as they faced the Miami Dolphins at Reliant Stadium on October 7, 2007, having won their first two games of the season but then lost the next two. In their second year under Head Coach Gary Kubiak, the club had made changes, most notably acquiring QB Matt Schaub from Atlanta and 30-year-old ex-Packer RB Ahman Green. 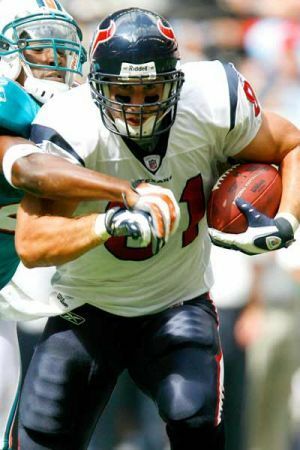 Schaub started off well, especially in combination with WR Andre Johnson in the first two winning contests, but when Johnson went down with a knee injury and Green was also slowed by injury, the Texans ran into trouble. The Dolphins, coached by Cam Cameron following the departure of Nick Saban for Alabama, had lost all four of their games to date. They had also brought in a new quarterback in the offseason, ex-Chief Trent Green, who beat out Cleo Lemon for the starting job in the preseason. While second-year RB Ronnie Brown was a bright spot, there were few others. The Texans had the first possession of the game and proceeded to drive 78 yards in 11 plays. Schaub misfired on his first two passes but then converted a third-and-ten situation with a completion to WR Kevin Walter for 16 yards. A personal foul penalty on Miami DE Jason Taylor turned a second-and-17 play into a first down along the way. Schaub connected with WR Andre’ Davis for 49 yards to the Miami two and while it took four straight handoffs to RB Ron Dayne to finally score, Houston had the early lead. The Dolphins responded with a scoring series of their own after rookie WR Ted Ginn Jr. returned the ensuing kickoff 52 yards. Green scrambled around end for a 23-yard gain to highlight a 46-yard drive that ended with a 23-yard Jay Feely field goal to narrow Houston’s margin to 7-3. Miami got the ball back quickly when a deflected Schaub pass was intercepted by CB Andre Goodman. 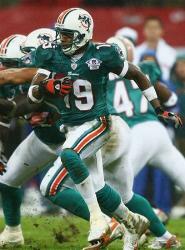 Goodman returned the pickoff 18 yards to give the Dolphins excellent field position at the Houston 25. On the next play, a scary situation that turned ugly occurred when an aborted handoff was fumbled and Ginn, recovering, attempted to reverse field and advance. Green was knocked unconscious while attempting to block. While lying motionless on the field, the player he blocked, Houston DE Travis Johnson, taunted him and drew a 15-yard penalty (as well as plenty of negative comments afterward). Green was taken off the field on a stretcher and was finished for the day (and, ultimately, the year). Cleo Lemon came into the game at quarterback and the Dolphins drove to a three-yard touchdown run by Ronnie Brown. With the successful extra point, they were ahead at the end of the first quarter by a score of 10-7. Early in the second quarter, and following a punt by the Texans, Miami scored again. Brown started the series with a 22-yard run and it was followed by a Lemon pass to Ginn that covered 36 yards. The Dolphins made it to the Houston 22 from where Feely booted a 40-yard field goal to make it 13-7. The Dolphins got the ball back again in good field position when Schaub fumbled while being sacked by Taylor and DE Rodrique White recovered at the Houston 41. Seven plays and 26 yards later, Miami added to its lead as Feely was successful on a 33-yard field goal. With time running down in the first half, the Texans put together an eight-play scoring drive. Schaub completed passes of 16 yards to Davis and 20 yards to RB Samkon Gado and, after the series stalled at the Miami 36, Kris Brown (pictured at top) boomed a 56-yard field goal to make it 16-10 at the half. On Miami’s second play of the third quarter, FS C.C. Brown intercepted a pass by Lemon to give Houston good field position at the Miami 46. Seven plays later Brown kicked a 43-yard field goal to pull the Texans to three points behind. Following a punt by the Dolphins, Houston again drove to a long field goal attempt by Brown from 54 yards. It was successful to tie the contest at 16-16. Miami moved back in front early in the fourth quarter thanks to a 10-play, 40-yard series that ended with Feely connecting on his fourth field goal, from 48 yards. The Texans came back with a 64-yard drive in 14 plays. They converted two third downs along the way, including a third-and-13 situation when Schaub threw to TE Owen Daniels (pictured below) for 15 yards. Another Schaub-to-Daniels pass gained 24 yards to the Miami four, and while the Texans couldn’t punch it in from there, Brown came through with his fourth field goal of the contest from 20 yards to again tie the score at 19-19. The Dolphins took over possession with 5:25 left on the clock and short passes by Lemon got the ball into Houston territory. But after reaching the 38 yard line by the two minute warning, Lemon threw two incomplete passes and Miami punted. The 35-yard kick had the Texans starting their next series at the three. On second down, Schaub passed to Daniels for a 19-yard gain to get out of the hole. Two plays later he hit Daniels again for 14 yards and then WR David Anderson for 19 yards to the Miami 44. The Texans having taken their second timeout, Schaub passed to Walter for six yards and then spiked the ball at the 38. The clock ran down to one second before Houston took its final timeout and Brown came through with a 57-yard field goal to give the Texans a 22-19 win. Houston outgained the Dolphins (352 yards to 285) and had the edge in first downs (20 to 17). However, they hurt themselves with two turnovers, to one suffered by Miami. They also failed to run the ball effectively, gaining just 74 yards on 28 carries, and had difficulty reaching the end zone. Kris Brown kicked five field goals in as many attempts, with a record three of them coming from 54 yards or longer, including the game-winner. All of that came after he had injured his foot on the opening kickoff. Matt Schaub completed 20 of 34 passes for 294 yards but with no touchdowns and one intercepted. Owen Daniels caught 6 passes for 96 yards while Andre’ Davis contributed 79 yards on his 4 receptions and Kevin Walter added 5 catches for 67 yards. Ron Dayne rushed for 40 yards and a TD on 16 carries. For the Dolphins, Ronnie Brown was the offensive star with 23 rushes for 114 yards and a TD and a further 39 yards on 5 pass receptions. After replacing Trent Green, Cleo Lemon was successful on 15 of 27 throws for 151 yards and had one intercepted. WR Marty Booker was the top receiver with 45 yards on 5 catches. Jay Feely, overshadowed by Kris Brown, nevertheless had a good day as he booted four field goals in four attempts. Ted Ginn Jr., (pictured below) who caught one pass for 36 yards, also averaged 35.2 yards on his five kickoff returns. The Texans lost their next three games but ultimately ended up at 8-8 for the first non-losing season in franchise history. It still placed them last in the highly-competitive AFC South (all three teams ahead of them went to the playoffs). Miami suffered through a dreadful 1-15 campaign, not pulling out a win until its fourteenth game. Kris Brown was successful on 25 of 29 field goal attempts (86.2 %), including all five from over 50 yards. Injuries hindered Matt Schaub, who appeared in 11 games and passed for 2241 yards with 9 touchdowns as well as 9 interceptions. Trent Green, who had missed half of the ’06 season after suffering a concussion in the opening game, never played again for the Dolphins in 2007, although he did play as a backup for the Rams in 2008, his last season. Ronnie Brown, who played so well for a poor team, went down with a season-ending injury in the seventh game. He rushed for 602 yards on 119 carries (5.1 avg.) and caught 39 passes for 389 yards.